It's TWO! We're 2! 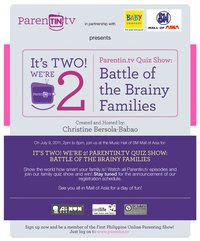 Parentin.tv Quiz Show: Battle of the Brainy Families on July 9, 2011 (Saturday) from 2 to 6 pm at the Music Hall of SM Mall of Asia. The main event is a family quiz show. The FREE registration (via www.parentin.tv or text message) for families who are interested to join will start on the first week of June. But as early as now, YOU have to start viewing and reviewing all our Parentin.tv episodes because the questions for the quiz show will all come from the topics that we have discussed in all our episodes! On the day of the event, all winning families will receive prizes in cash and gift items from our sponsors. Stay tuned for the announcement of our registration schedule. See you all in Mall of Asia for a day of fun! Also, starting June, our web episodes will be aired on Knowledge Channel. Follow us there! Be a smart parent, watch Parentin.tv! Punta ulit tayo dear. Masaya ang Parentin eh. Happy Anniversary, Parentin.tv .. More power!